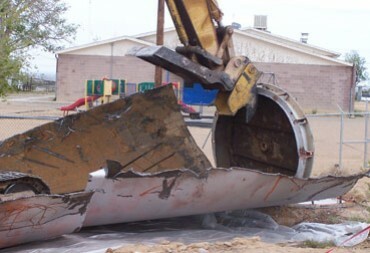 Project Description: This water system redesign included abandonment of one well, demolition of a 40-year-old elevated steel storage tank, installation of booster pumps for fire protection, and the replacement of piping infrastructure. Additionally, the school’s wastewater collection was aging and needed to be redirected from the Bacavi system to the Hotevilla sewer system. 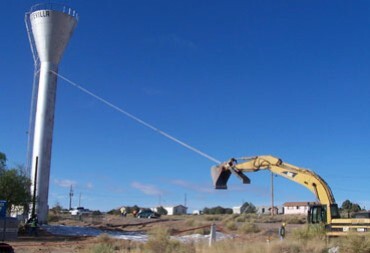 CVL installed new infrastructure — piping, manholes and a grinder pump — using applicable Hopi Tribe, IHS and Bureau of Indian Affairs standards. Because the elementary school remained in session during this project, CVL coordinated agreements with all construction parties to limit activities to four days/week. This kept student schedules on track and minimized disruption without any loss of school days. CVL’s efforts produced a water and sewer infrastructure design that ultimately saved $50,000 in construction costs to the school, while providing a more reliable utility service. On-site fire protection was a necessity for this site. In discussions with the School Board and concerned parents, CVL discovered that response times from the area fire department were typically one hour. Fire flow needs were met by installing a dedicated 500 gpm package booster pump system with emergency back-up power. This gave the school its own fire protection system, thereby saving lives and preventing property damage should future accidents occur.